There are lot of talent hunt shows and events to search the best Talent Show Score Sheets in the given category. It is also to judge skills or gift the candidate carries. If the applicant has special talent then he/she is given points on the score sheet based on which the participant will be taken to another level. The show score sheet is the one that keeps the record of every contestant. You can check online the sample talent show score sheet that can be used for the talent show. The format is also available in Word and excel sheet. 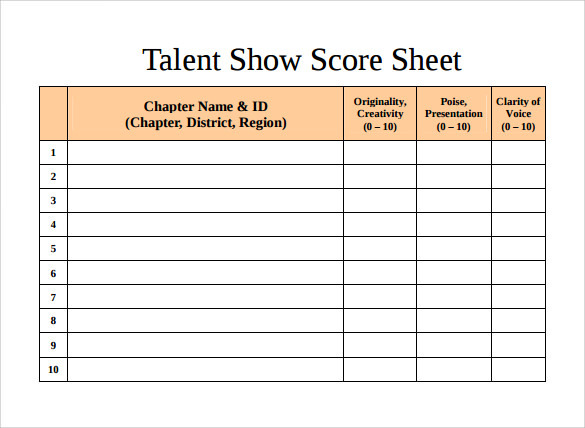 The score sheet for talent show contest template features separate sections for recording the assessments and the performances of the imagination, confidence, creativity, crowd appeal and presentation of the contestants. These templates are extremely useful for the judges in jotting down the details and taking final decisions later on. 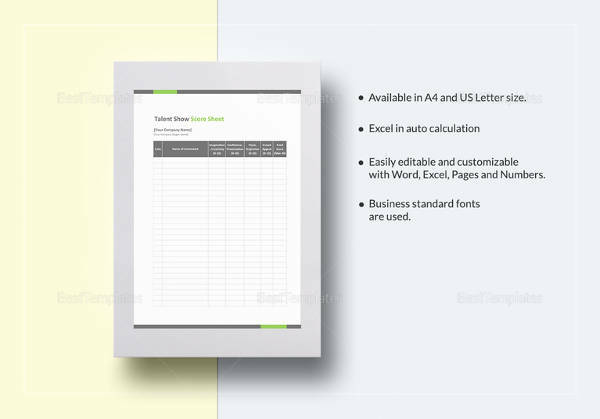 The sample talent show score sheet template stands as an example giving the perfect idea about the look of a talent show score sheet template. The template features a number of sections that the judges can use for detailing the different parts of the performance of the contestants. 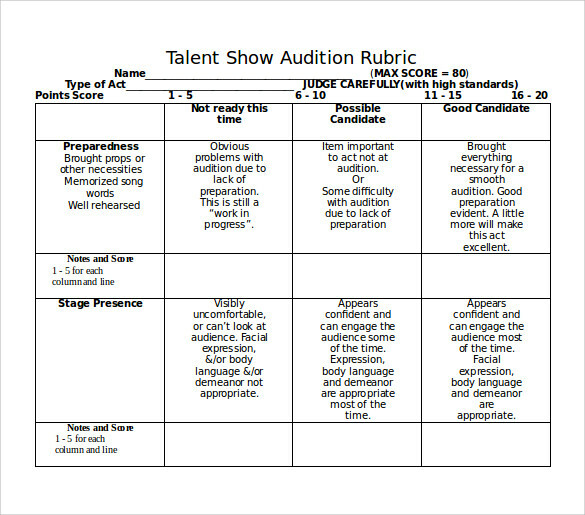 As the name suggests, the talent show judge score sheet template is quite helpful for the talent show judges who are required to put in the scores of the contestants along with the weaknesses and the strengths of the performances of the contestants. This template is easy to use and is also available in easy to understand language making it quite convenient for the judges to carry out their task in the most efficient manner. 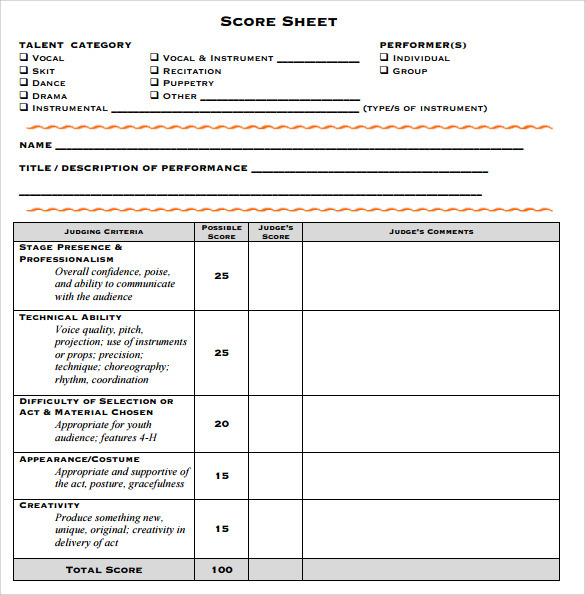 Why Do You Need Talent Show Score Sheet Templates? Talent show score sheet templates are used during all kinds of events and talent shows for noting down the scores of the contestants and for comparing the results. These templates come in a wide assortment of choices featuring different sections for putting down the scores. There are sections that are further subdivided into various categories based on the talent show type. Therefore, you can easily select the template of your choice and download a talent show score sheet template along with samples that you might need for noting down the scores and the results of a talent show that is telecast on TV. 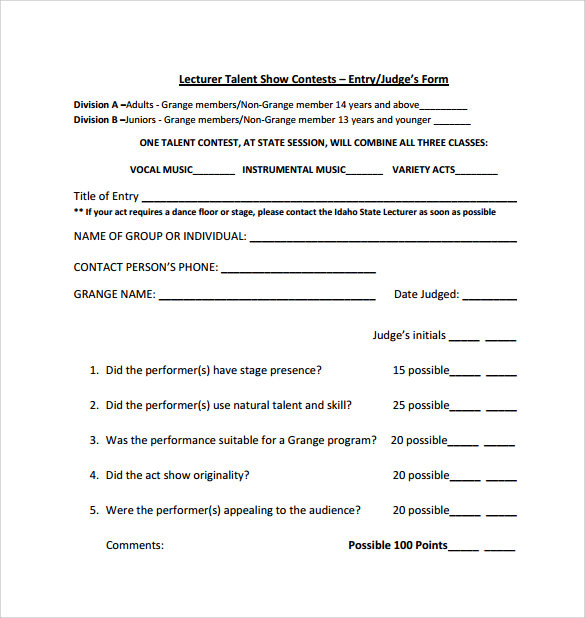 The talent show score sheet templates available throughout the internet are mostly free of cost and can easily be filled out in regards to your needs and requirements. You may like Interview Score Sheets. 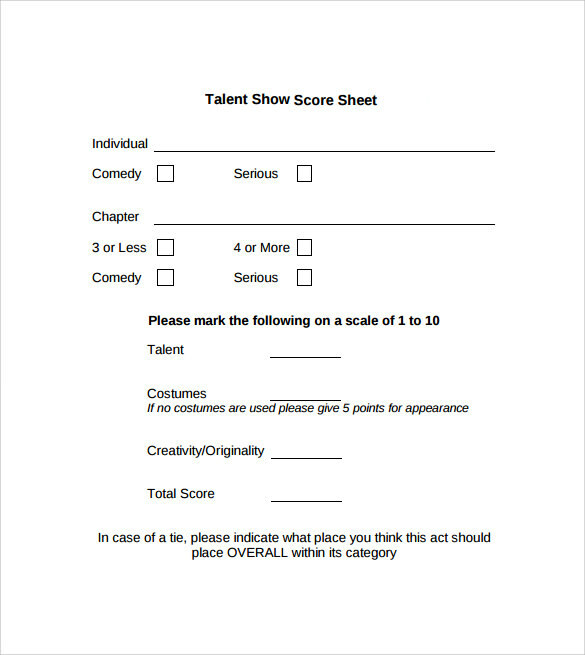 When Do You Need Talent Show Score Sheet Templates? Different types of talent hunt events and shows are conducted for searching the best performer in a given category. 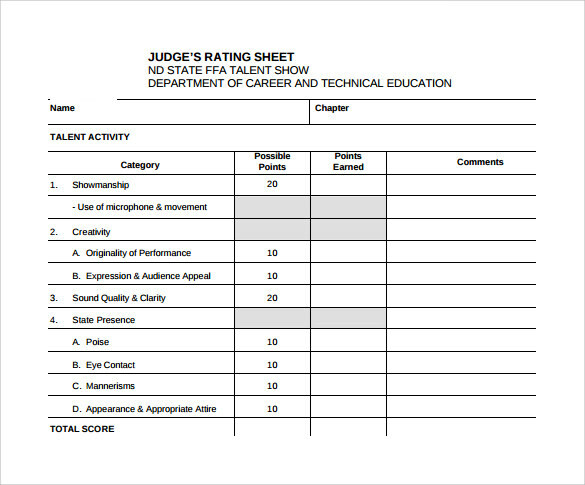 The talent show score sheet templates can be used for judging the skills of the contestants and for offering them a good career. 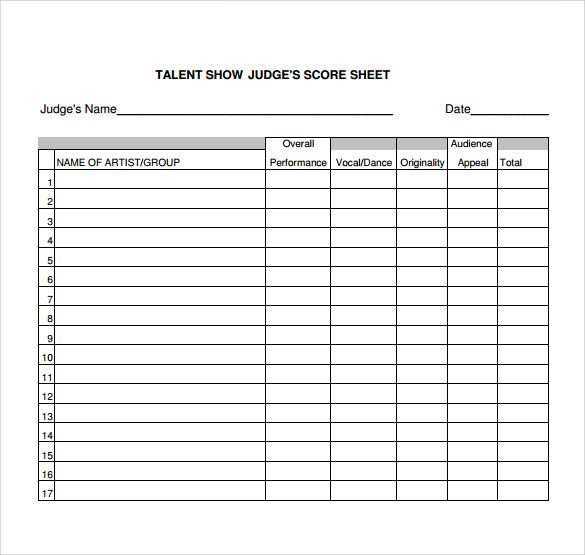 The talent show score sheet template is needed when the judges are required to keep a record of the different contestants participating in a talent show. 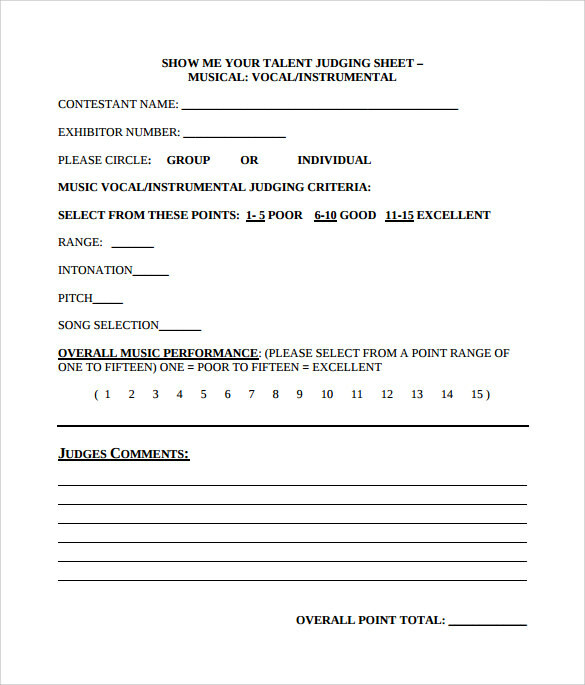 These templates are impersonal and generally they do not have the right level of finesse to be used in the form of talent show score sheet templates. These templates can easily be availed online and can even be handled very easily. These are explicit documents available for satiating the requirements of organizations and people. 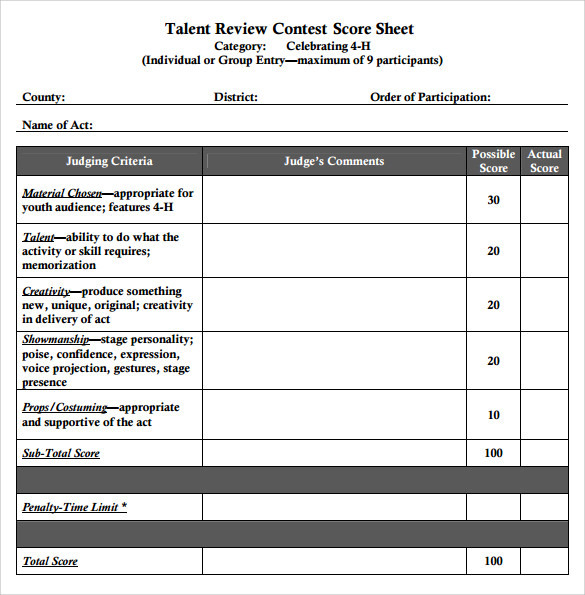 What Are the Benefits of Talent Show Score Sheet Templates? One of the major advantages of talent show score sheet templates is that they can be used very easily without having to go through a lot of hassle. The judges at a talent show do not have to waste their valuable time in preparing detailed score sheets for the contestants. These templates are readily available online and can simply be downloaded for the best use. The overall procedure of organizing a talent show, judging the show and then coming up with the final results becomes quite easy with the use of talent show score sheet templates.